Assuming you have blogger template you created or have downloaded and want to know how to upload it on your blog. This post/article will give you guidelines on how to upload blogger templates, whether you're a newbie or a pro. To improve your blog's design, will need a new good and responsive template other than the default blogger templates that have limited widgets/gadgets, although the default templates are good to use, but yet they don't give your blog a professional look. 1. Blogger supports XML web template. So if your template is in zip format, extract it using winrar. 2. Login to your blogger dashboard, click on 'template'. On the top right corner you should see 'backup/restore', click on it. 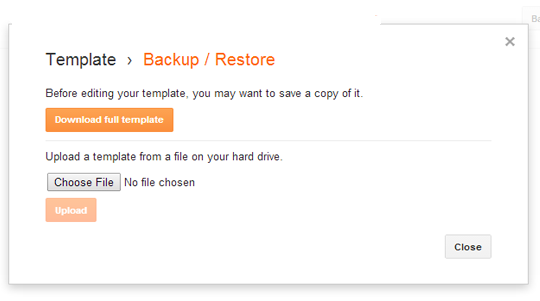 Backup your template by clicking on 'download full template'. 3. After backing up your template, click on 'choose file' which directs you to your computer's folders. Locate where you saved the extracted XML file. 4. Select the XML template from your PC then click on 'open'. This will redirect you back to blogger. 5. Click on 'upload' and the process ic completed. You can choose to customize the blogger template on how it should appear on mobile and desktop versions of your blog. If you find this article useful please share with your friends and if anyone fined any difficulty then don't be shy to make use of the comment box below.